Lewis Hamilton has taken his second pole position of the season today in qualifying for the 2015 Malaysian Grand Prix at the Sepang International circuit. The session started off dry, but rain in Q2 set the scene for a tricky top 10 shoot-out, that saw Hamilton get pole position by less than a tenth, with Sebastian Vettel impressively out-qualifying the second Silver Arrow of Nico Rosberg in 3rd. Vettel’s team-mate Raikkonen was a high profile scalp in Q2, with the Finn unable to get into the final session after a sudden shower. 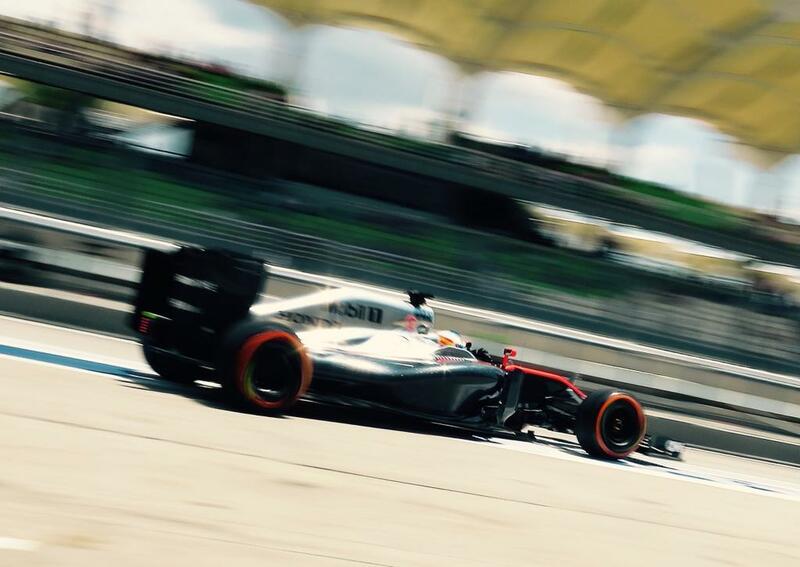 Both McLaren’s failed to get out of the first session along with the two Manor drivers. Both Roberto Merhi and Will Stevens failed to set a time within the 107% rule, but the FIA later gave the pair permission to race tomorrow from the final row of the grid. Most of the running that the teams had in practice was completed in sunny, hot conditions. Qualifying day arrived and the cloud had come in. Nico Rosberg topped in the final practice session ahead of team-mate Hamilton, with the pair looking fairly even as qualifying got under-way with thunder, lightning and rain gathering near the circuit. Strangely, the Mercedes duo went out on track early on in the first qualifying session, with the pair both using the faster medium compound tyre as opposed to the standard strategy of making a run on the slower compound first. Unsurprisingly, the pair both jumped to the top of the time-sheets soon after, with Hamilton a tenth clear of Rosberg. It looked as though there was more time on the table, as Sebastian Vettel was able to get within half a second of them on the slower tyre for Ferrari. Half the session had gone and the thunder and lightning was still lingering near the circuit and getting ever closer. The two McLaren’s were right near the drop zone as the clock ticked down to zero, but both were on laps to try and get themselves into the second session. Unfortunately neither would managed to lift themselves out of the drop-zone. Felipe Nasr had been looking as though he would advance, but late improvements from team-mate Ericsson and Romain Grosjean in the Lotus would push the Brazilian into P16 and out of qualifying; a stark constrast to his 5th place finish two weeks ago in Melbourne. The Manor pair couldn’t get within 107% of the fastest time by Lewis Hamilton, with Roberto Merhi just 4 tenths shy of the mark. Team-mate Will Stevens failed to run in the session after a fuel pressure problem from practice continued to warrant attention. The FIA later granted permission for both Merhi and Stevens to race tomorrow from the final row of the grid. With rain getting ever closer, cars were backed up at the exit of the pit-lane as the second session began. All the drivers headed out on the faster tyre, with drivers such as Felipe Massa and Nico Rosberg being told that this lap would be crucial. 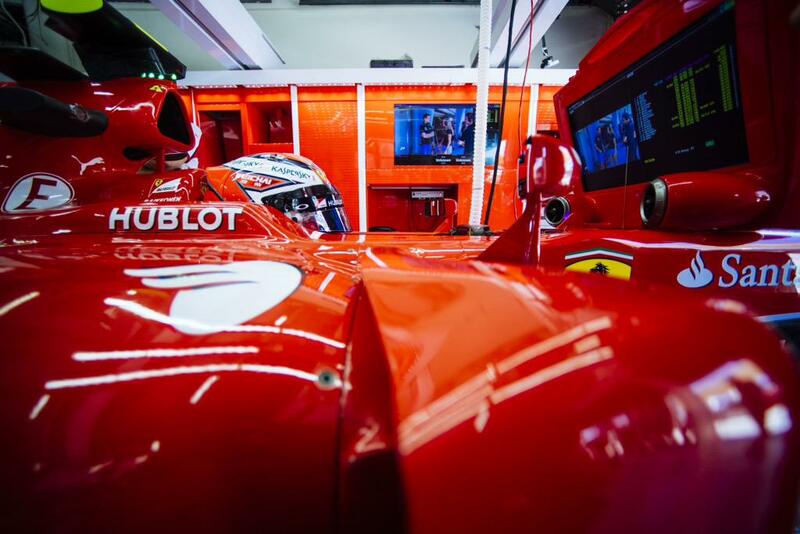 Vettel was one of the first on track and managed to set a 1’39.6 to take P1. Rosberg then came through two tenths faster. 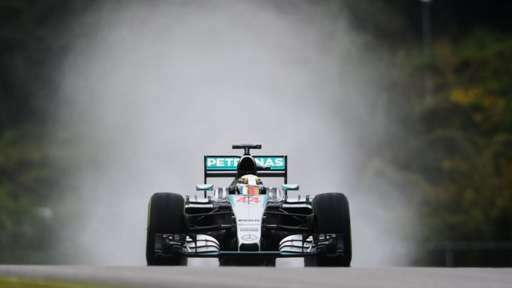 Rosberg’s team-mate Hamilton had an awful first lap after being stuck behind Kimi Raikkonen. He finished his lap in 8th and was 2 seconds slower than Rosberg. Thankfully for Lewis however, he had still done just enough to get through to the next session, as the rain suddenly fell down and prevented anyone else from going faster. This meant that with 9 minutes still on the clock, the order was settled as it would be nigh on impossible to improve. Kimi Raikkonen, who had been matching and beating team-mate Vettel near the top of the time-sheets, was unbelievably eliminated from qualifying in P11 ahead of Maldonado in the Lotus. The two Force India’s also wouldn’t get through into the top 10 shoot-out, with Carlos Sainz, who had impressed many in his first race in Australia, joining them in P15. Going through to the final session would be both Mercedes, both Williams, both Red Bulls, Sebastian Vettel, Romain Grosjean, Max Verstappen and Marcus Ericsson; who for the first time had advanced beyond the first qualifying session in his Formula One career. Over a half hour delay would follow as the rain continued to pummel down onto the Sepang International Circuit. Finally the rain stopped and the circuit started to dry up a little. The two Williams drivers and Marcus Ericsson were waiting down at the end of the pit-lane as the top 10 shoot-out neared its start; with those three drivers electing for full wet tyres and everyone else going for intermediates. All 10 cars were out on track within the first minutes of the session, with Bottas leading the charge on the wet tyres. Vettel and the other intermediate tyre runners were much faster than Valtteri however, with Vettel going fastest on a 1’53.1. The two Mercedes drivers followed soon after, with Rosberg heading through 2.1 seconds faster, before Hamilton took another 1.2 out of his team-mate on a 1’49.8. Max Verstappen also impressively jumped Vettel as he vaulted into 3rd with a 1’52.8. It wouldn’t last too long as Vettel got back ahead of the Toro Rosso rookie on his next lap. With just over 2 minutes to go, the two Mercedes drivers were not far apart on track as they prepared for another flying lap. Rosberg was a few seconds ahead of Hamilton, but Rosberg soon started slowing. Hamilton was on a flying lap, but as he got close to Rosberg he had to slow down and bail out of his lap as Rosberg was on the racing line. Hamilton overtook and then the pair began their final laps. The chequered flag came out, but Hamilton had bailed out his lap due to more traffic from Felipe Massa. Sebastian Vettel had come across the line just 7 hundredths slower than Hamilton, which meant that it was possible for Rosberg, who was still on a lap, to topple his team-mate. It all appeared to unravel however, as Rosberg crossed the line with a slower time than Vettel. He would have to settle for third as his team-mate took pole position for the Malaysian Grand Prix. It would be the same top 3 as we saw last year, with Vettel and Rosberg 2nd and 3rd behind Hamilton. Red Bull had a fantastic session, with Ricciardo and Kvyat qualifying in 4th and 5th respectively, a great performance after seemingly struggling in practice. It was a great performance also for Max Verstappen. The 17 year-old put in a strong and untroubled performance to take a brilliant 6th place on the grid. Felipe Massa and Valtteri Bottas may have been first out onto the track in Q3, but they would end up qualifying down in 7th and 9th, with the Lotus of Romain Grosjean splitting them in 8th. Marcus Ericsson completed his first top 10 shoot-out in the final position; his best ever qualifying performance. Both Bottas and Ericsson were later promoted a position after a 2 place grid penalty for Romain Grosjean due to a pit-lane infraction in Q2. *Roberto Merhi and Will Stevens are at the discretion of the FIA as to whether or not they will race tomorrow after failing to qualify within the 107% rule.